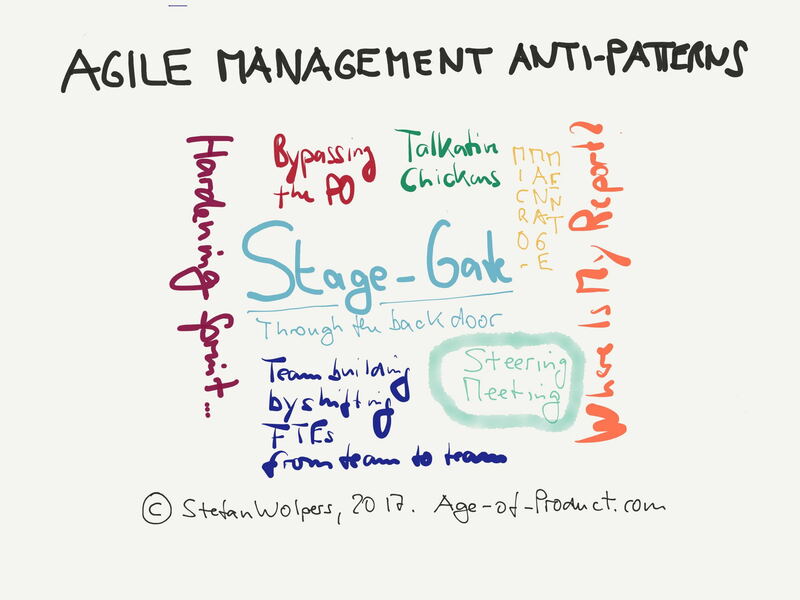 Learn more about agile management anti-patterns the aspiring agile manager should avoid during the organization’s transition. From stage-gate through the back door to the ‘where is my report’ attitude. “I am a CSM, too.” A manager should avoid mentioning this level of formal education in discussion with agile peers if she wants to be taking seriously. While everyone will appreciate the effort, participating in a 2-day workshop does not mean that she mastered navigating the waters of dual track agile. Respect needs to be earned; it is not delivered by rank. Using the budgeting process as a stage gate to exercise control through the back door: The budgeting process is hard to align with agile requirements like the longevity of teams. Hence, the original process will have to change over time. However, it is a sign of mistrust, though, if the management uses the budget permanently as a means of controlling the teams, making them “pitch” every two months or so. There is absolutely nothing “agile” to be found in this practice. Instead, the management ought to provide the teams with goals and guidance how to achieve these along with funding that is sufficient to meet the objectives. The ‘where is my report’ mentality: The manager expects to receive reports regularly instead of participating in ceremonies, for example, the stand-ups or the sprint reviews. A quick look at the Manifesto for Agile Software Development should help the manager, though: ‘Individuals and interactions over processes and tools’ is a core principle of all agile practices. Steering meetings: Unimpressed by the agile ways of working, the manager insists on continuing the bi-weekly steering meetings to ensure that the team will deliver all her requirements in time. This one has a quick remedy, though: just do not participate in meetings that have no value for the team. Telling people how to do things: In the good old times on the shop floor, it was a valuable trait to train newcomers or work groups in the art of assembling a Model T—as the manager probably did herself. Nowadays, as we invest most of our time building products that have never been built before this attitude becomes a liability. Just let the people closest to the job at hands figure out how to do this. Guidance by objectives and providing support when requested or needed will be appreciated, though. Abandoning management all together: Interestingly, some managers seem to believe that self-organizing teams do not require any form of management anymore. Nothing could be further from the truth: There are always issues at an organizational level that teams love out sourcing to their management. If you like to figure out what that might be, give Management 3.0’s delegation poker a chance. Disrupting the flow: The manager disrupts the flow of the scrum team by inviting random team members to various meetings of little or no value, or by disrespecting time-boxes of scrum ceremonies, or the sprint itself. Scrum master, you will need to intervene in this case. The latest, 254 pages strong version of "Agile Transition – A Hands-on Manual from the Trenches w/ Checklists" is available right here, and it is FREE! That went well! Please check your email to confirm your subscription to our weekly “Food for Agile Thought” newsletter and download your free ebook 'Agile Transition – A Hands-on Manual from the Trenches'! NOTE: If you do not receive the confirmation email within about 10 seconds, please also check the spam folder. Thank you! Hardening sprints: While the idea of continuous delivery is to permanently provide more value to customers by frequently shipping new code, it is fine to continue thinking in releases. There may be legal reasons for that, or customer care and sales need to be thoroughly trained in advance, or the customers prefer it this way. What is not acceptable in an agile engineering organization, though, is preserving QA as a separate, siloed entity that demands time for end-to-end testing before releasing any new code. That is true cargo cult agile. Instead, move the QA engineers into the scrum teams and focus on test automation and other well-established CD practices. Reporting session: The manager expects that everyone delivers a sort of status report. The anti-pattern has an advanced version: the manager “runs” the stand-up, signaling the team members when it is their turn to speak. Pitching developers: The manager tries to sneak in small tasks by pitching them directly to developers, this ignoring the product owner as well as basic scrum principles. No manager in the trenches: Managers do not attend the sprint review. (There are several reasons why managers do not attend the sprint review: they do not see any value in the ceremony. It is conflicting with another important meeting. They do not understand the importance of the sprint review event. None of the sponsors is participating in the sprint review, for example, from the C-level. To my experience, you need to “sell” the ceremony within the organization to successfully transition to an agile organization. What management anti-patterns have you observed? Please share with us in the comments.